Building a new house with a 20’ by 16’ theater in the basement. I would like to install one of those star field ceilings that doubles as an acoustic treatment. I would prefer to use a system that has fabric stretched over the entire ceilings so it’s one uniform black sky , as opposed to star field tiles where you can see the individual tiles. Any suggestions on a specific product or technology to use ? It’s sort of overwhelming when you look at all the products out there. I know fiber optic stars used to be the standard, but it seems LED and other systems may be now be better and perhaps more economical. Also Bluetooth control for colors and shooting star etc would be cool plus ! Led is used to light the individual fiber optic strands. I havent seen offerings in which the stats are actual leds. a single piece of fabric is going to be your challenge. Finding and attaching. If you have designed your lighting properly for your theater you won't be able to see seams in black fabrics. Basically no lights shining directly on the ceiling. Get fabric experts to come in and do it. Rolls of very dark black fabric can be seamless for 5m or less in the smallest dimension and any length (which fits with your 16'), combined with a fibre optic kit with 1000-2000 stars. It's a time consuming process, and it can be done DIY. I don't think you will achieve a nice effect with LED's instead - but there's no reason to pick LED over fibre optic anyway. Bluetooth control and the kits are relatively cheap - it's the time taken to run all the cables. FYI - I am doing the same, over a similar size, all linked in to a central control (Control 4). I'm not doing myself, getting people to do it as part of my cinema installation. I don’t think I will be able to find expertise for a DIY type installation of a star field , and most likely poking hundreds of holes for the fiber optic stars will be too time consuming. Is there a reasonable pre-fab or semi custom product with black acoustic and fiber optic stars (ideally with some effects) ? 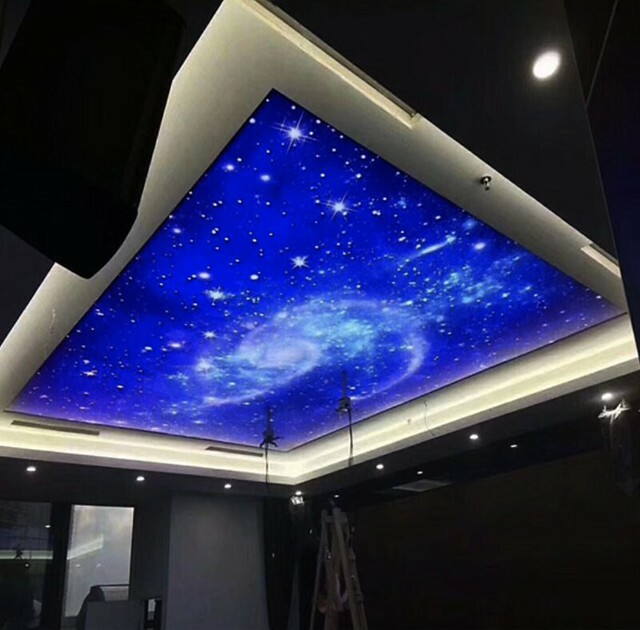 The only one I found was Starcoustix and there price was $47 per square foot PLUS labor , which is $15,000 for a 16x20’ starfield , materials only. Seems very expensive ?! My honest view: you wont be able to find the combination of a pre-fab with seamless. There are all manner of kits with modules (squares etc) but they all end up with seams, and likely more expensive. It'll probably end up slightly cheaper to pay a fabric installation company to do it - pick your own ultra black material - and just pay their labour to poke the holes. Make sure it's a company who have done it before. I would make a recommendation but I'm UK based. If you did want to save some money - it's really not a technically difficult job to do and I've read lots of DIY threads with total costs < 2000 for similar size screens. You just need a fibre optic kit and a roll of fabric. If you personally can't do the DIY you can probably find someone who can. Do you mean something like this? 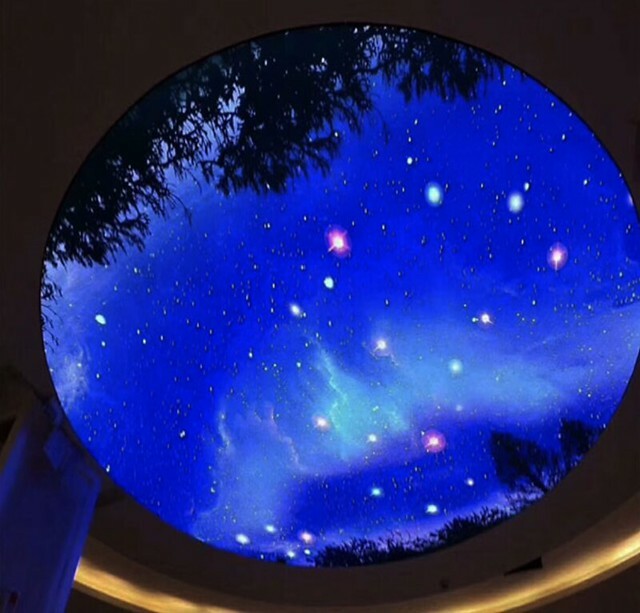 I have a company that is trying to get me to start offering these ceiling... but I haven't decided yet. The only reason to use individual LEDs instead of fibre optic is if you want the max brightness to be high enough to work as room lightning; fibre optic will not achieve this, but a sufficient number of 2mm LEDs will. I'm considering doing this for my garage, but it would be a huge amount of tedious soldering to manually install several thousand LEDs. Using strings of LED fairy lights (running behind the false ceiling panels in a random pattern) would save time but wouldn't look as good as they're all 5mm or bigger: to get a star effect you'd really have to use the 2mm tower LEDs. In fact you can buy 'LED star curtain' for parties & events, but it is definitely just a lighting effect, not even semi-realistic due to using a small number of oversize LEDs (compared to a fibre optic star ceiling). Last edited by bitphase; 04-19-2019 at 07:11 AM.